Register for 2019 Summer Resort Now! St. Mary’s Summer Resort is dedicated to developing the whole child through inquiry-based exploration. Our unique program includes Academic Prep, Specialty Camps, Day Camp and Athletic Camps all in an educational environment. Students will have the opportunity to meet new friends, try new things and make new memories while attending our Summer Resort for Grades 1-8. 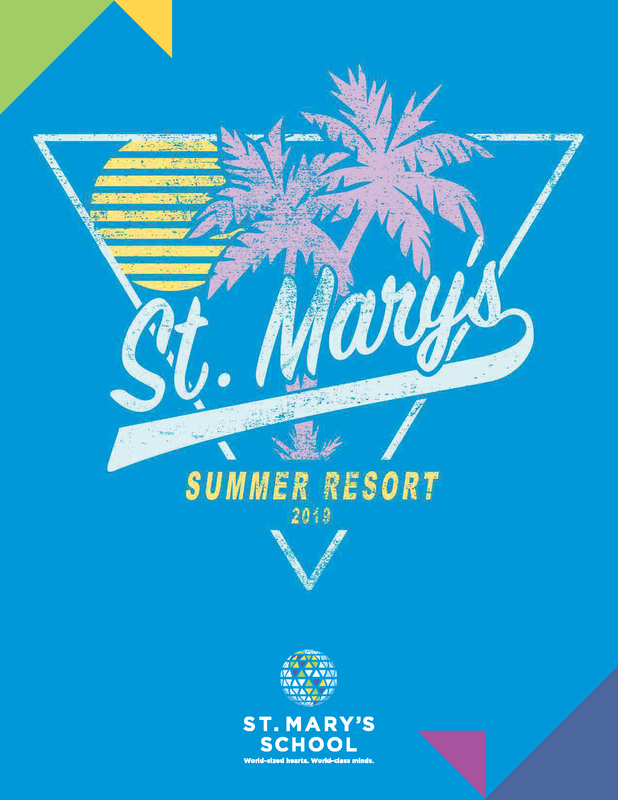 WELCOME TO ST. MARY’S SUMMER RESORT! Our Summer Resort is a robust program that offers something for every student, as young as two year-old to Grade 8! Through inquiry-based explorations students are able to participate in: Academic Prep Programs, Specialty Camps, Athletic Camps and St. Mary’s Day Camp! In a safe and fun environment, students can try new things, sharpen skill sets and make new friends at St. Mary’s Summer Resort. Academic Prep Program (Junior Kindergarten – Grade 8): Grade-level camps to prepare students for the coming fall. Each class is designed to engage and reinforce critical reading, writing and mathematical concepts. Specialty Camps (Junior Kindergarten – Grade 8): Allow students to pursue new interests or further explore a passion area. We offer a wide range of camps from cooking to dance to Jedi Training Academy. Athletic Camps (Grades 1-8): Focus on fun, skills, technique, sportsmanship and overall game strategies. Students can try a new sport or hone their skills on their favorite sport. These camps help prepare students for the upcoming season while keeping our athletes active over the summer. Day Camps (Age 2 – Grade 5): Foster students’ emotional, social, physical, cognitive and creative growth in an age-appropriate, safe environment. Students will experience science, art, creative play and so much more all summer long! All of our camps are week-long sessions unless noted. Lunch is included in all full day (9 am – 4 pm) and afternoon (Noon – 4 pm) camps, EEP through Grade 8. Enroll online at smaa.org/summerresort. Campers are considered completely registered once the enrollment fees are paid. Please pay them at the time of registration to ensure a spot in the camp. The $40 registration fee is non-refundable. To receive a 10% discount, register before the early bird registration deadline on April 1, 2019. St. Mary’s reserves the right to cancel or combine classes and camps based on enrollment. To request a refund, a written notice (email: summerresort@smaa.org) must be submitted at least two weeks prior to the start of the class or session. Any changes after the expiration of the early bird discount will result in a loss of the early bird discount for that class.